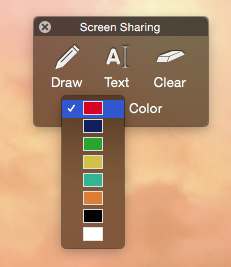 Screensharing is a useful feature that allows you and your participants to share application windows or your/their desktop. This article illustrates how to share a screen on a Mac computer. Text: Click on this button to create a text box that you can write in. Erase: Click on this button to immediately erase all of your markings.